1. 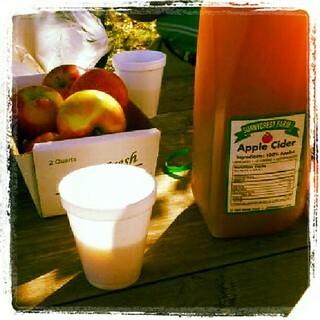 Visit apple orchards, farms, fairs, etc. 2. Spend some quality time with my knitting, or doing something else crafty. 3. Watch football. Go Pats! 4. Hang out with our wonderful NELCAR family... translation: go racing! 5. Take the dogs for a ride. Trips to their favorite pet supply store or to the dog park to meet up with one of our former foster babies for a play date are always fun! 6. Enjoy a real breakfast (not just a yogurt or bagel), either at home or out... and a few leisurely cups of coffee! 7. Relax and catch up with TV shows on the DVR, a good book or magazine. 8. 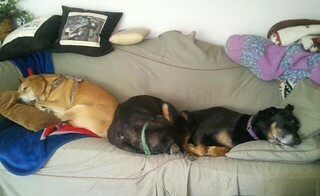 Take a cue from the dogs and enjoy an afternoon nap every now and then. 10. Take a drive and end up where we may... perhaps some outlet shopping or the zoo, lunch at a new spot or ice cream from our favorite farm. Day trips are the best! Looks like the exactly perfect agenda to me! Now you just have to wait for the weekend again! All sounds good to me except football I'm afraid. Have a lovely evening. Really leisurely weekends...I like those alot! Love how you have room for three dogs on the lounge... I barely have enough room for one, which is why she has her own bed!!! Oh the joys of a Great Dane!! All of dat sounds like a most wunderful way to spend da weekend!